Short Version: a wire to wire victory (my second ever!) in my favorite place to run at in the world. And I won a head to toe Lululemon outfit (more on that later) :-) All in all a pretty awesome day. So unlike my friend Chad's Summer of Sloth, I've taken the past 10 months or so and made it the Season of Slow. After training for three marathons over the previous two years, I just need to reacquaint myself with running for fun. No training regime, no set number of miles/days, etc. As a result, interestingly enough I actually ran more races in the spring than I usually do. Most of them on a whim and just in the middle of running 35-40 miles/week. Nothing special but allowed me to keep in ok but not great shape and gave me a relative sense of where my running was at. With summer came the return of our oldest from preschool and the challenges of running as a stay at home dad with two kids under 3.5 at home. That need to be entertained. A lot. Needless to say most running was predawn outside of the occasional guest appearance at OTC. So zero races over the summer though with school just around the corner, I had gotten an email about the Forest Park Half. I entertained foolish thoughts of running the full (thank god I didn't) but elected to run the half 1) because Forest Park is my favorite place in the world to run in, 2) it was for a good cause (a fundraiser for the FP Conservancy) and 3) it being a trail half allowed me to have no problems whatsoever about a relatively slow time. I had to miss last year's inaugural edition due to NYC training so I was very excited to just enjoy the day and have it be a good kickoff for getting in shape for Boston. The week leading up to the race was ugly; got back from being out of town on Tuesday night to a sick youngun', all my runs just were devoid of energy and generally just wasn't getting enough sleep/rest to feel confident about anything related to the race. As a result, Becca and I agreed that I was heading out solo. Usually the kids like to take in the festivities but there wasn't going to be much to see outside the start and finish. So after feeding the kids and myself, I was off to Lower Macleay park for the start expecting nothing other than an enjoyable run through the forest. 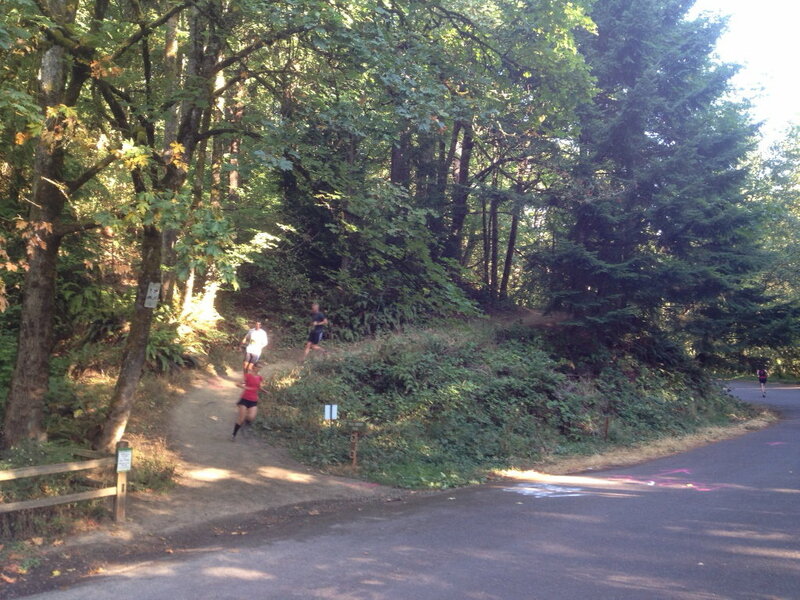 Climb out of Lower Macleay until you hit Wildwood. Climb Wildwood until Wild Cherry. Fly down Wild Cherry until you hit Leif. Run Leif for 3ish miles until Firelane 1. Climb Firelane 1 until Wildwood. Follow Wildwood to Dogwood, climb again until meeting back up with Wildwood then charge back down to Lower Macleay park and the finish. Suddenly I had an impending sense of a lot of hard work ahead. Good news was I didn't care where I finished; just that I enjoyed myself. I had a feeling I would need to remind myself of that later in the race. We were called to the start which resembled a middle school dance. A few go-getters (maybe 7-8 of us at the line) and a lot of people hanging back just milling around ready to go whenever Todd Janssen sent us on our way. Todd asked us if anyone planned on running fast today; I piped up and said I'm either a slow fast guy or a fast slow guy. I'd claim either and wouldn't be offended by the other. He smiled and wished us luck. The guy next to me and I took turns predicting how long it was going to be until one of us got ate up by the fast people. With that the race was off. I took the lead and just took off up the trail. We didn't have much pavement before hitting the trail so immediately your body starts doing the calculus needed to combine speed with navigating rocky terrain. I felt ok enough but without looking back, fully expected someone to come up beside me or blow past me. As I made the turn onto Wildwood, I looked back and saw a few people; the first I saw was the eventual women's winner with two guys a little further behind. No matter; it was way too early to be worrying about anything yet. Firelane 1? Definite oof. The last few times I've run it I've come down it so I forgot that in a half mile you really put your legs through hell. Throw in the false summits and I was really, really hurting. I wore my Garmin (mainly just for record keeping) and the only time I looked at was half way up Firelane 1. My lap pace at the time? 12min/mile. Felt about right :-) That stretch was absolute hell. I really felt at times that I could have moved faster walking but felt that if I did, I might never get restarted. So I just kept on my toes, pushing one foot in front of the other, reminding myself that eventually everyone else had to navigate the same spot. After finally hitting the top, I hit the second aid station. It was here that I easily made my best tactical decision. I actually stopped, caught my breath, made sure I was properly hydrated and got back after it. It might have only been 15 seconds or so but it was a huge chance for my lungs and my searing quads to get a brief respite. From here I knew I had some space to fly so I did just that. Cranking along the deep switchbacks of wildwood, I began to take in a bit of the scenery (albeit at a higher level of suffering) while also peaking back at the switchbacks to keep an eye on any hard chargers. No one yet. Hmmm... Could I actually pull this off? In hooking up to Wildwood for the last 1.5 miles or so, the full pain of the race really began to take hold. For me it's a type of pain I really enjoy. I'm not a 5k guy; the pain that comes with that makes me miserable. I know I should experience it more but I'll take the pain created by the use of every muscle in your body navigating the turns, rocks and uneven terrain in an effort to not faceplant, crash and avoid offleash dogs any day of the week. :-) At this point, after still having not seen or heard anyone in a while, I had to accept that unless I crashed I would be winning this race. As a result, I threw caution to the wind and kicked it into high gear. I passed the last water station, throwing my hands up and yelling "I'm not touching it this time! ", garnering a snicker from the volunteers. One foot in front of the other. See that rock. See that root. See that off balance spot. Just keep driving the pain train to the finish. A tight turn and I was onto Lower Macleay trail. As I passed various hikers and runners, it really hit me that I was going to win and win in a place I consider my spiritual home from a running perspective. As as dad of two little ones who lives across town, my chances to visit are few and far between. But Forest Park always fills me with energy anytime I get in a run there. So to do this made me beyond happy. Of course, with about a 1/3 of a mile to go I had a bit of a heart attack. I passed a runner who yelled "looking great, you're in second!" Second? WTF? How'd someone pass me, MF'ing jetpack? This just caused me to use whatever bit of reserve I had to drive even harder towards the finish (turns out it was the winner of the marathon who'd been ahead of me at that point but still, thanks for the heart attack dude!). I hit the opening, hoping that he was wrong and when I heard the cheers, I knew I was the winner. It was pretty cool to have your name called out as I blazed down the home stretch. Of course, the spotter got my number wrong and so they didn't get my name until after I finished. Didn't matter; felt like the world to me nonetheless! wife (with kids running around like banshees in the background): "hey, you're finished earlier than you thought. how'd you do?" me (quietly since there were a lot of people around me and I was feeling self conscious): "I won"
wife (with said kids): "what?" me (slightly louder): "I won"
me: "So I might be a bit later than I thought getting home since I have to stay for the awards ceremony"
wife: "stay as long as you want. Though your daughter has already requested croissants so don't forget"
So the awards ceremony: they did the women's first: 3rd got a $25 gc, 2nd got a hydration belt (and thank god b/c if that had been for the winner I would have donated it back to give to a volunteer; anyone that knows my running style knows I hate them with a passion and I spent a good 2-3 minutes staring laser beams through those belts) and first got a float therapy gc and a certificate for running clothes at lululemon in the pearl. At that point, I'm thinking "man, I'm going to get some sweet schwag; I wonder what the men's equivalent will be?" So with this Great White Whale of a story coming to an end, I got to run 13.1 miles on some of my favorite trails in the world. To win a race was merely icing on the cake, albeit some chocolate ganache quality icing. More importantly, $33000 was raised for the FP conservancy. Next year I plan on being back to defend my title (or maybe move up to the full?) and more importantly raise additional funds for such an amazing resource. Short Version: Fantastic course, amazing crowds and my second favorite marathon (I have a HUGE soft spot for Boston). I decided 5k in to see how long I could keep my 2:55 pace. The answer was about 22 miles before cramping in my left quad and toes(?!) led to me run/walking the rest of the way in. Not how I wanted the race to go but I came away happy with going for broke and learning lessons along the way. Like that a Cuban Cigar & Rye Whiskey make for a nice post-race meal when you’re sitting on your friend’s roof overlooking Manhattan, Brooklyn & Staten Island. Now time to focus on some shorter stuff for a while. New York is a story of revenge (of sorts). I'd qualified for NYC via the Vancouver Lake Half Marathon in January '10 and in an effort to build upon my successful Boston trip last year I decided to train hard for New York last year. I was in fantastic shape and two weeks away from taking on the course in the best shape of my life when my body broke down. A bad SI joint left me no choice but to scrap the trip. No less than a month later I was in a nasty car accident having been rear ended and my car totaled. I thankfully walked away but was left with a concussion and a jacked up lower back for my troubles. As I eventually started to feel healthy again, I started up running. It wasn't pretty but I eventually got back into a groove but not without a few injury related bumps in the road. As I got stronger, my thoughts again migrated towards NY. I was guaranteed entry for one more year so I decided to sign up and give it another go. When it was time to start the training cycle, it was all about managing expectations. I hoped to be in good enough shape to requalify for Boston and felt confident in doing that but was also just excited about the opportunity to experience the race and let the cards fall where they may. Of course, as the OTC folks can attest I'm usually not one to sit back and enjoy the view. Training continued to improve as I both got faster and learned how to manage my previous injuries while upping mileage. The other side of training though was this was my third cycle in less than two years; there were plenty of times during training where I just felt burned out and wanted to scrap the effort and be done with it (never mind the exhausting fact of navigating life with two kids under 2 ½). However by the time the last few weeks of training came about and boasting a new 10k PR, my thinking had shifted and I felt a 2:55 (a 2:30 min potential PR) was a possibility despite the difficulty of the NYC course. With that I packed my bags, said goodbye to the family (logistics and finances made sending the whole family a no-go) and jumped on a 5am flight to NYC. I enjoyed my time in NYC pre-race, potentially to the detriment of my race performance. In the first 48 hours, I got to see Feist at the Brooklyn Academy of Music, run through Brooklyn Park and over the Brooklyn Bridge, do the race expo, walk around NYC, go to the Varsity Letters series (readings of sports books by famous authors) and just really walk around and embrace the city. Of course, by Friday night my legs were shot and my muscles were screaming for rest. Saturday turned into a day of total sloth and while I’d felt confident on the flight out, my nerves and general mind set was such that I had no idea what Sunday would bring. 5am isn’t TOO early to wake up for a marathon. However it is when you’re not racing for another 5 hours. No matter; a PBJ sandwich and a quick check of all the necessary equipment left me walking to the subway and arriving at the Staten Island Ferry 20 minutes ahead of schedule. It was great walking up in the dark and just hearing the worldly feel of the race; all the languages flowed over us as the volunteers tried their hardest to get people out on the earliest boat possible. The ferry was fantastic. Found a nice seat towards the front and was able to get a few nice pics of sunrise in the city. The one thing I didn’t realize pre-race that I know now; once off the Ferry it’s a good 20-25 min bus ride to the Fort. I got shoved on a bus and ended up standing for the entire trip. All in all between the walks to and from subways, standing time getting to the race and the death march at the finish (more on that later) I probably did an additional 4-5 miles and was on my feet a good 90+ during the day. Definitely something to keep in mind for people making the trip in the future. The marathon village was pretty low key for me. I found a place to camp under the tents (despite the beautiful weather I was all about conserving energy and just staying off my feet as much as I could), read the WSJ and laid low until it was time to go the corrals. I made my first mistake there. Once they started moving us to the start line, I decided to ditch my clothes at the last available donation point. This tactical error left me a) underdressed for hanging out on the bridge for 40 minutes and b) pushed me further into my original corral. When I finally found a place to settle, I realized I was by the 3:15 pace guy. Not exactly what I was hoping for but reminded myself it was a marathon not a sprint. The start itself was jarring. Mary Wittenberg asks “are you ready?” then BAM! the cannon goes off and we’re out of the gates. I quickly shot back out with a “thanks!” to the little kid. As I was running away, I hear three guys in their best NY accents yell “I bet you feel better now!! !” I gave them a thumbs up and beelined back towards the blue line in an effort to conserve energy and run the course smart. Feeling great at this point and just watching the miles clip along. Mainly just banging away through Brooklyn. Seamlessly integrated with the other two corrals at mile 8, enjoyed seeing BAM in daylight and mainly just focused on continuing to run smart and take on plenty of fluids. At this point I definitely enjoyed having just the constant noise; the Brooklyn crowds are great and that coupled with the entertainment made for an enjoyable experience early on. It also led to me reminding myself to be smart about not overdoing it early on. Somewhere in the back of my mind Tim’s warning of “beware the last 5 miles” sat waiting to be used. The only other bit to note here for me was that I was excited in a way to run through the Hasidic Jewish neighborhood. Just to experience a completely different part of NYC was something I was looking forward to as part of the run. However, I was so focused/dialed in/spaced that I didn’t realize I was in their ‘hood until a man ran in front of me to cross the street! Transition time or better known as Queens. The crowds definitely drop down a little bit here both in terms of numbers & volume. This part might also be the quietest part of the course. Queens is quieter, the Pulaski bridge is very quiet (minus the solo bagpiper) and reminds me more of a generic city overpass (much like the first of the Newton hills in Boston). I was really happy to hit the half @ 1:27 at the bottom of the Pulaski and at that point I felt in control and comfortable. Little did I know that the hills ahead were going to make me potentially rue the pace. The 25k mark is at the base of the Queensboro Bridge and is the entryway into Manhattan and the insane crowds that await. In looking at the map & the altitude chart before the race, I knew this would be my last major hill but wasn’t too worried about it thanks to the running I do throughout Portland. In retrospect, I should have been more worried. The combination of the hill and the silence left me alone with a body that was starting to suffer, if only slightly climbing up over the bridge. This was definitely the first time my legs started to tighten up. The turn onto first avenue was as promised though; a wall of sound and a total motivation to attack first avenue and enjoy the fact that you had the opportunity to run through Manhattan without anyone chasing you! Thankfully I didn’t pull a Ramalaa and instead just kept clipping out 6:40s and pointing myself towards the final borough. As someone pointed out afterwards, leave it to the Bronx to channel my inner temper on some poor unsuspecting (but well deserving) runner. With that we crossed the Madison bridge (I’d left him behind but suspect he caught me later) and reentered Manhattan for the homestretch and the 5 miles Tim had previously worried me about. From there it was just a slog. I want to say I enjoyed the beauty of Central Park, was motivated my the amazing crowds and powered my way to a PR. The reality was me just managing the pain, running a half mile at a time (amazingly at close to race pace) then being overcome with cramps/pain and having to walk 50-100m before having enough strength to get going again. Somewhere in this stretch I also realized I’d stopped my watch. So it wasn’t until the end of mile 24 that I realized I’d logged an almost 9 minute mile and 2:55, a PR and likely 3:00 were all out the window. Thankfully I knew the difference between the race clock and my original clock so at least I knew where I really stood. As I approached the finish, I took off my hat and charged through the finish line. Just over 3 hours. A good time but not nearly where I was hoping goal wise. Normally a result like this would have left me frustrated with being so close, especially since had I not stopped to try to work out the cramp I would have been nearly guaranteed a sub 3 hour time (though as people have pointed out something much worse could have happened to the muscles...). However, this was the first race since I can remember where I went for “broke” from the start and let the chips fall where they may. In the end I was happy to be over the line and despite things having gone nowhere near how I expected to have finished NYC and finished my “revenge” mission of sorts. Of course, the marathon itself exacted some revenge on me and gave me a humbling reminder of what a hard event this is both physically and psychologically. As people have pointed out in previous years, the finish line is nothing short of a death march. It was easily another mile of walking before finding my bag. Combine that with a stop at the medical tent to make sure everything was kosher (and find someplace to toss my NY apple; I mean who eats an apple after a marathon?) and it was almost a hour and a half after the race before I had my bag and was able to call Becca. The good news is the logistics gurus that are UPS had my bag lined up and ready to pick up, change and head into civilization. A mocha and two subway stops later, I was back in Brooklyn exhausted but with a medal around my neck and an experience I’d never forget. I’m not sure I’d run NYC again, but I’m really glad I’ve done it!